A couple excluded from the hotels and guest-houses of their home town, and later forced to flee as refugees from state persecution. A child who is excluded from his community and eventually from life itself, dying in solidarity with all who suffered the shame of crucifixion. The best way to celebrate Christmas, therefore, is to reflect on- and repent of – the way we exclude other people and other voices from intruding on our comfortable existence. I think today, Christmas Eve, especially of my Palestinian Christian brethren. They are caught in a vulnerable position between, on the one hand, an aggressive Israeli settler movement and an equally aggressive Islamist militancy, on the other. Rarely, if ever, are their voices heard in mainstream secular news media. The Great Annual Examen Reflecting BACK on the past 12 months and anticipating the NEXT 12 months by Stephen W. Smith 400 years ago, Ignatius of Loyola crafted a genius way of prayer. His method helped a person reflect back upon their day and their life in terms of how one experienced God. He developed a prayer called, The Daily Examen. It is both a challenging and comforting way to trace the movement of God in one’s life. After having spent a solid year in study, reflection and prayer using Ignatius’ method of prayer, I’ve come to the conclusion that Ignatius was a genius. I only wish now that I had known about this decades earlier. Never before, had anyone in the history of the church, shared such a bold new way of spending time with God, ourselves and our own hearts. This Great Annual Examen is based on Ignatius’ way of reflection and prayer. I assured her that they did and that such has always been part of being human and having bodies. . .
Did you realize there are three stories of Jesus’ birth in the New Testament? There’s Matthew’s and there’s Luke’s and there’s . . . John’s. No not the John of the Fourth Gospel but John the Seer of book of Revelation fame! I think that’s right. But I think it is of more general applicability. These five statements are essentially the message of Ecclesiastes. What life “under the sun,” apart from God, is and feels like. We do our best to fight against these realities but mostly end up screwing ourselves and others up in the process. And then we die. Living with God doesn’t mean life won’t feel like this. That’s life in a fallen world. God and his covenantal relationship to us is all that keeps our heads on straight and our heart centered where they need to be. And strengthens us to find our significance and security in relation to God rather than the myriads of other ways we try to find it. A boy sits on the porch with his grandpa and dog. The dog sees a white rabbit race across the yard and takes after it howling like crazy off through the woods. Other dogs in the neighborhood hear the first dog and chase after it as it chases the rabbit. After a time, the other dogs drop the chase one and by one. Only the first dog is left. "Why is our day the only one left still chasing the rabbit, Grandpa?" "Boy," Grandpa replied,"once a dog has seen a white rabbit he never stops chasing. Those other dogs only heard our dog chasing the white rabbit. And they'll stop chasing him pretty quick." Our chance to newly chase or renew the chase of our White Rabbit comes again this Christmas. Do what you need to with that chance. It has become traditional this time of year for some clergyperson or theologian to confidently declare that “modern” people can no longer believe in such a thing as the virginal conception (virgin birth) of Jesus. It goes against the way we know things work. The virginal conception does seem preposterous. But, it always has. It’s not like people in the past had no idea how babies get made. I expect Joaquim and Anne found it preposterous when their daughter first tried to explain her pregnancy. I don't believe virginal conception glibly. I've had and will have my reservations, questions, and doubts about this and other aspects of the Christian Creed. But, I figure once you believe in something as preposterous as resurrection or that God loves you and desires communion with you; you're in for a pound, you might as well toss in the penny. 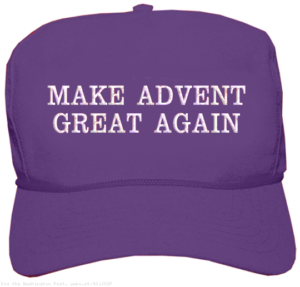 This last Sunday of Advent this year falls on Christmas Eve. In addition to the Annunciation story (Lk.1:26-38) and Mary’s Magnificat (Lk.1:46b-55), 2 Sam.7 and Psa.89 narrate and extol God’s covenant with David. Rich stuff, yes? But it may be Paul’s great doxology at the end of his letter to the Romans that aligns best with overlap of the fourth Sunday of Advent and Christmas Eve. Many families have a tradition of opening one present on Christmas Eve as a foretaste of the gift-giving to follow the next day. I want to liken Paul’s Roman’s doxology in this week’s reading as that present we may open early on Christmas Eve. In it Paul praises God and the one whom he has sent to fulfill all his purposes. Jesus is again in the temple. Chief priests, scribes, and elders accost him. These are the very folks Jesus predicted who would put him to death (8:31). Jesus is facing his executioners! Their question is more of an attempt to gather evidence in advance of his trial. It’s a kind of verbal cat and mouse. “Where you get the authority to do all that you do? We readers know the answer but Jesus withholds it instead answering their questions with one of his own. In truth, this is his way of answering their question without saying so in so many words. Jesus’ authority has been a prevalent theme for Mark and here he brings it to a climax. He has authority over Israel. Jesus answers: “Did the baptism of John come from heaven, or was it of human origin? Answer me” (v.30). His demand for an answer indicates his authority. The logic here is clear. All around this troubled globe, we’re seeing the rise of a phenomenon as strange as an ice-storm in a desert: the regressive revolution. We’re used, you and I in the West, and especially in the US, where our creation myth glorifies one triumphantly, to seeing revolutions as the wheel of human progress only ever turning forwards. But revolutions, more precisely understood, can go either way: the wheel can move backwards, too. Backwards revolutions, luckily, are rarer in the sweep of human history, and if they weren’t, then you and I would probably be stuck in caves, bonded to our plows. Hence, we’ve come to only see revolution as only positive things which enshrine democracy, rights, equality, and so on—like the French Revolution, the American Revolution, etcetera. Evangelism, under the sway of the 16th century’s emphasis on the individual person’s (sinner) relation to God (judge and forgiver), saw people as needing to know they were miserable sinners in God’s sight and that they ought to avail themselves of his gracious forgiveness. Evangelism calibrated to this theology sought, then, to find others’ weaknesses and sins and bring them the good news of the gospel (as they understand it). As long as the sense of guilt before God was strong in our culture, this approach seemed effective. I say seemed, because whenever we met someone for who life was going well, were decent people, successful, good marriage, children doing well, etc. we discovered our gospel has little to say to them. And as the sense of guilt before God ceased to be potent culture reality the gospel was speaking a language fewer and fewer people could or wanted to understand. This week’s readings are full of expectation, anticipation, and the sighting of buds and blooms of nearness. Appropriate texts for this Sunday in Advent, I think. We’re zeroing in on the figure of the Messiah. Last week we talked about the kind of waiting required of us, that paradoxical “waiting that hastens the Day of the Lord.” This week we look at waiting itself. We live between God’s acts in the past and what he will do in our future. Psa.126 captures this perfectly. The first three verses celebrate the Lord’s past actions for his people; the last three anticipate his actions in restoring their fortunes. Hope you’re hungry. Mark’s serving up another sandwich. One story split in two and another inserted between those two parts. Each story helps interpret the other. Speaking of hunger, Jesus is hungry on the way from Bethany. He sees a fig tree and inspects it for fruit, and is disappointed to find none, even though it is not the season for it. So he curses it. What’s up with that? Is Jesus ignorant? Petulant and demanding? Neither, I suspect. and they hunt each other with nets.